Is there a more perfect home for the laid-back way of life enjoyed by the liveaboard community than the seemingly endless scenic waterways of France? Boasting not only Europe’s most extensive waterway network outside of Russia - nearly 5,470 miles of navigable rivers and canals – but waters that also pass through a unique landscape rich with picturesque cities, towns and countryside and steeped in history and culture. The potential for the able boater with a lust for exploration is boundless. The country’s considerable network of canals was largely built in the 19th century to link up the main rivers and thereby facilitate trading routes. The trade may have dried up somewhat but these canals make life easy for the boater keen to explore the whole country. For those venturing across the Channel, the more direct passage into the heart of France is secured along the Seine from the port of Le Havre. However, despite being one of the longest and inland navigation routes in France – and its most recognised - the Seine actually carries comparatively little leisure traffic. This is due to the large commercial ships that dominate. The stretch downstream of Paris is particularly intimidating for small vessels. Nevertheless it is the most direct route into Paris, and few boaters can resist the temptation of seeing the majestic city from the water. It is easier going south of Paris, where up until Saint-Mammès there are comparatively few locks and the countryside is bucolic. From there the Seine leads into two of the best-loved boating regions in the whole of France, Burgundy and the Loire. Although in part designed to provide vital north-west passage linking up the Seine and the Rhône, the spread of canals in France’s eastern centre also provide a wealth of navigational treasures along the way. The 150 mile long Canal de Bourgogne provides a particularly pleasant thoroughfare through the very pretty scenery of the Côte-d'Or, Burgundy – including the sacred splendour of mustard capital Dijon – as well as the Yonne, with Tonnerre’s rich tapestry of historic castles, abbeys and vineyards. The 198 locks that pepper the route provide some respite from the dreamy surroundings. 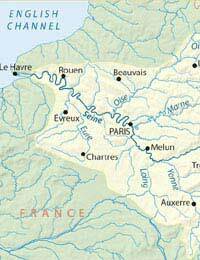 Within this broad region are also the canals Loing, Briare, Centre and latéral à la Loire. Together they form the ‘Bourbonnais Route’, a popular canal passage down to the Rhône and ultimately the Mediterranean. However, with such eye candy as Gustave Eiffel’s magnificent 662 metre long aqueduct at Briare, the beautiful hilltop town of Sancrerre and fields upon fields of sunflowers, they are a destination in themselves. In fact the 162 mile stretch of Loire valley to the west between Sully-sur-Loire and Chalonnes-sur-Loire is so remarkable it is a World Heritage Site. Unfortunately although the Loire heads all the way out to the Bay of Biscay at St Nazaire, much of it is no longer navigable by anything other than rowing boats. From the central canal region, the Rhône tributary the Saône is a popular access point for the eastern reaches of the country. Unlike the deep and wide lower Saône with its enormous modern locks, the upper section offers very pleasant navigation, passing through pretty small towns and villages before leading into the Canal de L’Est towards Nantes. The Canal Rhône au Rhin also offers a convenient eastward route towards the border cities of Basel and Strasbourg. These routes unlock the potential for exploring the tiny Alsace region with its striking fortified towns, dramatic Black Forest and Vosges mountains. The Lower Saône is the gateway down to the Mediteranean, leading from Chalon, through Macon and the region’s vast array of vineyards, before it joins up with the strong currents of the mighty Rhône at France’s gastronomy capital of Lyon. Many miles westwards along the coast from the mouth of the Rhône is Sète, the beginning of the Canal des Deux Mers. This waterway connects the Med with the Bay of Biscay at Bordeaux and is comprised of the Canal de Garonne and the much celebrated Canal du Midi. Of all France’s waterways the Canal du Midi is easily the most popular with visitors, attracting a fifth of all the country’s river tourism. They are attracted not only by its status as an engineering and historical marvel but also because it cuts through some of France’s loveliest countryside. BrittanyAs a region surrounded on three sides by water it is perhaps surprising that Brittany offers its own substantial network of canals and rivers, with more than 370 miles of navigable waterways reserved for leisure activities and boating. Its two main routes are the Canal de Nantes à Brest, which runs east west between the two city ports, the Canal Ille et Rance which passes through Breton capital Rennes.